Buoyed by a large group of returning staff (one of whom, visual caption head Ken White, was called up to go overseas in the wake of the war in Iraq) and a new equipment trailer, Impulse is set to field "a more mature and sophisticated program" in 2003, according to Charles Hargett, the corps' brass specialist. 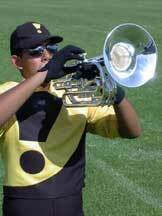 Impulse lead soprano player Raymond Garcia (shown here with a baritone), in a photo outtake for an upcoming marching brass company ad. "Show design is on schedule," Hargett said. "We hope the crowds will love our production of "Pure Imagination -- music from Willy Wonka." We have taken familiar themes from the film and made them our own." As in years past, drum corps fans will recognize Impulse's unique blend of versatile musicianship and a high-energy visual program. Over the winter, Impulse farmed out its members to schools in Southern California who were looking for music and marching technicians. "We were more than happy to help many of our members find positions with many bands and drum lines," Hargett said, adding that the current crop of Impulse members "have spirit and talent. Our dedicated members come to us from successful bands throughout the area." Hargett also said that a new set of drums "has helped us to attract a really talented group of drummers." Hargett cites the "greater communication" between the staff and members as being a positive change organizationally this year, which "should help our program really take off this season," Hargett said. Hargett noted that the returning staff has designed a unique Impulse program. "Dan Zeilinger's up-tempo and jazzy arrangements, along with some musical surprises are designed with the audience in mind. We're thrilled to have Chad Kohlmier returning with his eclectic brand of guard work. The addition of Southern California percussion clinician Ike Jackson has given our drum program a real boost," Hargett said.